With a May 17 deadline fast approaching, Pheasants and Quail Forever is encouraging farmers and ranchers to consider utilizing a federal program that provides financial and technical assistance to establish habitat that benefits monarch butterflies, pollinators and other wildlife. 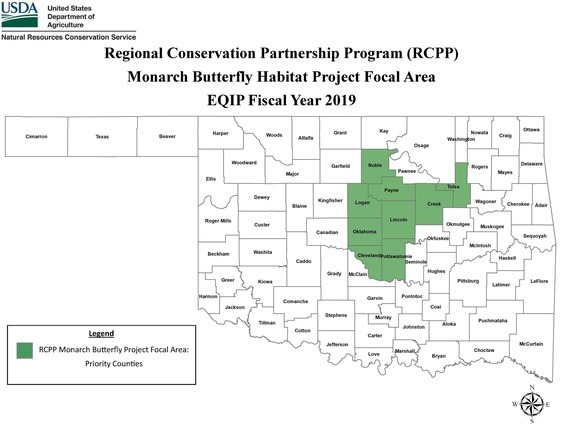 According to Coordinating Wildlife Biologist Dustin Lamoreaux, the Monarch Regional Conservation Partnership Program (RCPP) administered by the USDA’s Natural Resources Conservation Service (NRCS) helps landowners increase and manage monarch habitat on private lands. Milkweed and other nectar-rich plants provide food for monarchs and other pollinators, such as honey bees and native bees, that are vital to agriculture. To accelerate conservation benefits to monarch butterflies, the Monarch RCPP was established. This project focuses on improving fall nectaring habitat for monarchs on existing native grasslands. There are many ways landowners can establish monarch-friendly habitat including but not limited to: brush management, prescribed burning, prescribed grazing, and monarch plantings. Establishing and restoring native grasslands, with milkweed and other nectar-rich plants, within Oklahoma is critically important because it is in the heart of the butterfly’s habitat and migration corridor. Milkweed also provides homes for beneficial insects that control the spread of destructive insects. Also, conservation practices that provide benefits for pollinators also help reduce erosion, increase soil health, control invasive species, provide quality forage for livestock and make agricultural operations more resilient and productive. NRCS can help producers manage their pasture and rangeland in ways that increase critical populations of milkweed and nectar-rich plants while also improving the health of their rangelands. In addition, pollinator plantings can be placed along field borders, in buffers around waterways or wetlands, in pastures, and in other suitable locations. NRCS accepts applications on a continuous basis, but only applications filed by May 17 are eligible for the next round of funding through NRCS’ RCPP Environmental Quality Incentives Program (EQIP). For more information about any NRCS program and to fill out an application, please check with your local USDA field office, or contact Dustin Lamoreaux at (405) 714-7893 or email at dlamoreaux@pheasantsforever.org for more information about wildlife habitat assistance.